Instructions: Come early if it is your first time for attending a yoga class, or you haven’t been in a while. Takes about 3 minutes to get registered and settled in. What Happens Next? You sign in, find your place in the room, gather the yoga props provided, a block, a yoga strap, a yoga blanket, and a yoga eye pillow. If you don’t have your own yoga mat, I have a couple extra, that can be borrowed. We will start with some easy breathing exercises, some warm up movements for our backs, then start with core movements, easy strength movements, easy balance poses, then guided relaxation and steps towards a meditation practice. How Long? An hour. You’ll feel at ease, stressed less, a bit more balanced and flexible. See you at Wesley UMC, 3515 Helena Avenue in Nederland, Texas. Yoga questions? Please give me a call, Gail Pickens-Barger, at 409-727-3177. Please leave a message. Posted on July 31, 2018 by yogawithgaileee. 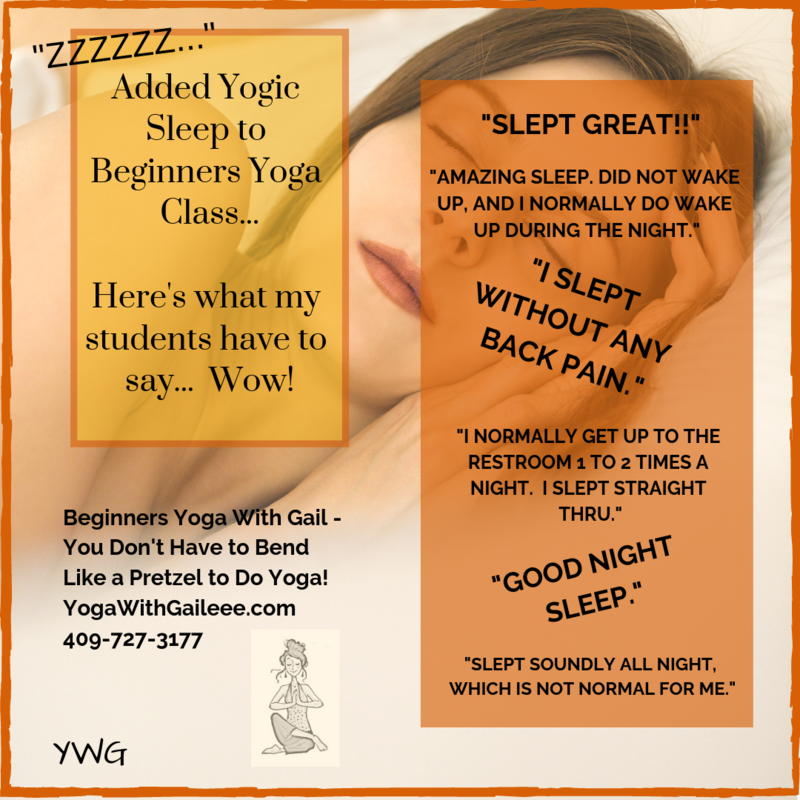 This entry was posted in #BeginnersYoga, Uncategorized and tagged Beginning yoga classes in Nederland Texas, Beginning yoga in Beaumont Texas, Beginning yoga series, yoga class, Yoga classes in mid-county, Yoga classes Near Me. Bookmark the permalink. ← Why Exercise is So Good for Your Brain!